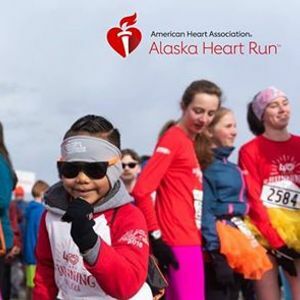 Join the American Heart Association for the 2019 Alaska Heart Run on Saturday, April 20 at the Alaska Airlines Center - right in the heart of the UMED district. The event is family friendly and features a challenge for everyone. Sign up for a 5K timed or untimed length or a 3K walk! Check-in opens at 7:30 a.m. and the timed runners will take off at 9:30 a.m., with the untimed racers and walkers departing at 10:00 a.m.
By participating in the Alaska Heart Run, you are not only taking strides to prevent heart disease and stroke, you are also funding lifesaving science that saves lives. The Alaska Heart Run is proudly presented by the Alaska Heart & Vascular Institute with support from Providence Health & Services Alaska and Pediatric Cardiology of Alaska Seattle Children's. Run for yourself. Run for a survivor or in memory of a loved one. We can’t make a difference without you. Join us.